Well I did it, on Sunday morning 30th July I ran 21.1km for the Children’s Medical Research Institute. It was a tough day, but I got there. I want to thank everyone for their donation’s and support, it means a lot to us and believe me it helped me get to the finish on the day. I had a couple of little troubles in the two weeks leading up to the run and at one point was very worried about being able to complete the distance. But I’m pleased to say I did manage to complete the distance and everyone’s support was in my mind as it got tough. The Run Melbourne event was hoping to raise 2 million dollars for charity. To date, they have reached 1.9 million, so still a little way to go. But everyone’s support has helped get the event to a total of over 1.9 million, so thank you. From my perspective, I have raised just over $3,200 and this is all because of the great support I received. Myself and everyone at EBS are proud to support this event and the CMRI are very thankful to you for helping make this happen. 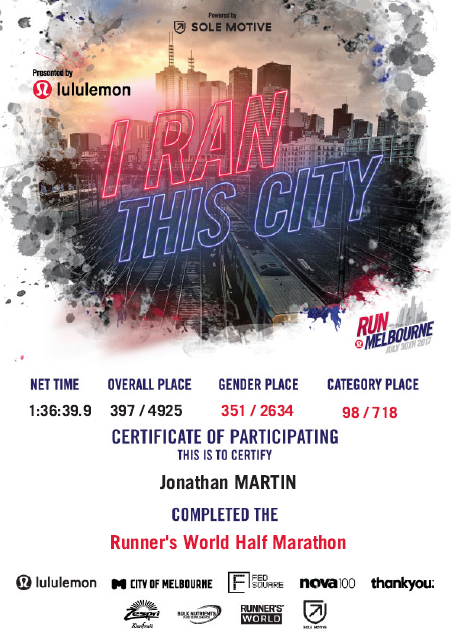 Over the past two years where I participated in Run Melbourne we have raised almost $10,000, which I think is a fantastic contribution and a very telling perspective of what a great community we have around EBS. Thank you again for your generosity, here’s the proof that I did it and as you can see, I’m still smiling. For anyone interested in the ‘race report’, I will add further details here. As I mentioned above, the two weeks leading up to the event I had some issues. On my last long run (15k) two weeks out I pulled up sore in my right heel and ended up not being able to run for the final two weeks at all. Following on from that I seemed to pick up a cold and that really put me down in the last week. So by the time I got to the starting line I wasn’t sure how I would go, would my heel stop me, would my lungs get me to the finish? All the doubts come in at that point, but you have to trust in your training even though you haven’t run for two weeks and you are not sure what is going to happen. The race started off quite well, if anything I went out a little bit fast but you get caught up in the sea of runners and end up trying to find some space and get out from all the crowds. The first 5k’s were good, I remember thinking how my heel was feeling fine and my lungs were also not bad. I looked at my heart rate and it was through the roof, in actual fact, it was almost at max heart rate which was a bit of a worry. As I ran further I actually exceeded my max heart rate by about 7 bpm (but I put that down to not being well leading up to the event). 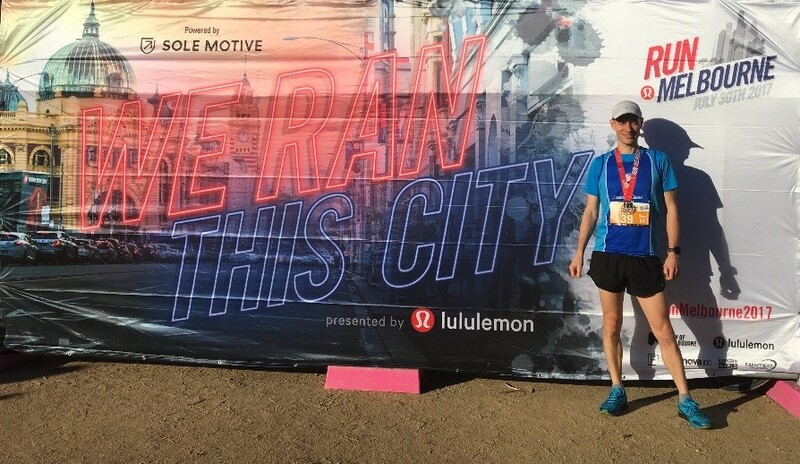 By the 10.55k half way mark I was really going well and when I looked at my time I thought this is “great”, but at the same time I knew I was going to have to reduce my pace as the less than perfect conditions leading up to the race were taking their toll on me. My high heart rate, my less than perfect lungs and at this point my burning muscles, it all had to give. I started slowing a little to try to bring everything back in line, at a few points I even walked or 10 to 20 seconds just to try to get my heart rate down and get my muscles to relax a bit. By 18k’s everything was burning but I pushed on, again the support from everyone involved helped drive me to the end. This post was written by Jonathan Martin, Director at Evolution Business Systems. Evolution Business Systems (EBS) is a Microsoft Gold ERP Partner and business management software specialist that equips its clients with software designed to achieve their business goals. EBS offers small to medium sized businesses a complete, fully featured, whole of business solution to meet their needs with Microsoft Dynamics NAV, O365, Power BI, Dynamics CRM and Microsoft Dynamics 365. It’s available for deployment on Microsoft’s own Cloud servers – Azure – and packaged at an affordable monthly subscription price. EBS works alongside its clients to understand their business and vision, and offer solutions to support these both now and into the future.